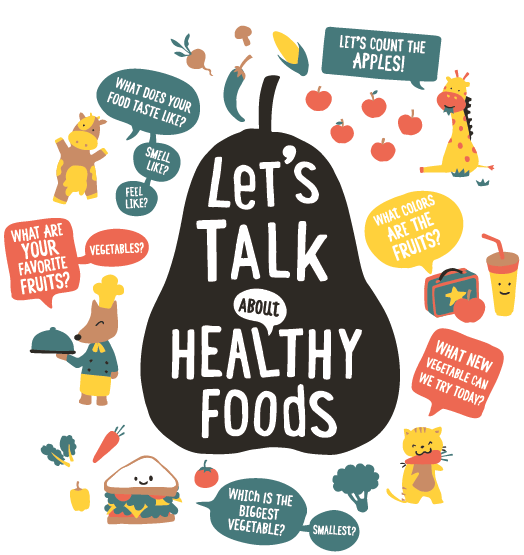 Let’s Talk About Food | JPMA, Inc.
TALK about healthy foods. Sharing conversations during meal and snack time can help families bond. Use words to describe the colors, shapes, smells, and tastes of foods. You can even make up fun food rhymes like banana, zanana, fanana! READ together every day. Read words you see around you at the grocery store or farmer’s market. At bedtime, cuddle and read books about healthy foods. SING songs about fruits and vegetables like “Apples and Bananas” to help your child get excited about healthy foods.